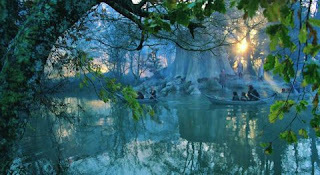 A kind correspondent (Glen Klugkist of South Africa) pointed out that in my articles on the populations of Middle Earth at the time of Lord of the Rings I had missed out the magical realm of Lothlorien: home of Galadriel and Celeborn, and "the heart of Elvendom on Earth". I reproduce our thoughts on this below: basically we agreed that the population of Lothlorien would be similar to that of the northern Elven kingdom of Mirkwood. In one of your articles you estimate the population of Thranduil's kingdom in Northern Mirkwood at the time of the War of the Ring, at roughly 30 000 Elves, if I understand correctly. Do you think Lorien fell into the same population category, seeing that it was also a woodland realm? My own first estimate for Lothlorien was in the region of 17 000 to 20 000 Elves, but looking at the surface area of Lothlorien and the fact that Galadriel's forces seemed to have total control of the entire forest from its borders inward, I revisited my estimate and came to new but still very rough estimate for Lothlorien's population of 36 000 - 40 000 Elves. Do you think thats way off?" I'm ashamed to say that I seem to have missed Lothlorien out of my estimates. I covered Eriador and The southern lands, and then the lands of the Hobbit, but Lothlorien is the one sizeable population that doesn't fall into any of these categories. I would concur that the best guess for Lothlorien's population would be around the 30,000 that I estimated for Thrandruil's realm. It has a very similar history and role in Lord of the Rings. Both are recorded as having sent out 'Armies', in both the 2nd Age to the War of the Last Alliance and right up to and including the War of the Ring. We can tell Lothlorien's size quite easily, it is about 30 miles by 50 miles (thanks as always to the Atlas of Middle Earth by Karen Fonstad). We can't make any comparison in that regard to Thrandruil's kingdom because it was never clear what area the Elves controlled or inhabited in northern Mirkwood. We know of one significant town or 'city' for both (Caras Galadhon and the Elven King's Halls) and a reasonable degree of organisation. It seems Rhovanion 'kingdoms' were very low population compared to Gondor or Rohan. But still given Lothlorien's ability to maintain their borders against threats from both Mirkwood and Moria (even given the power of Galadriel's ring), and even to send out armies to invade Dol Guldor, I don't think a population of much less than 30,000 is credible. To give a range I would estimate 20,000-30,000 Elves. We can't be more precise than that I fear.